Aims: To investigate if recent technical and procedural developments in percutaneous coronary intervention (PCI) significantly influence outcomes in appropriately selected patients with three-vessel (3VD) coronary artery disease. Methods and results: The SYNTAX II study is a multicenter, all-comers, open-label, single arm study that investigated the impact of a contemporary PCI strategy on clinical outcomes in patients with 3VD in 22 centres from four European countries. The SYNTAX-II strategy includes: heart team decision-making utilizing the SYNTAX Score II (a clinical tool combining anatomical and clinical factors), coronary physiology guided revascularisation, implantation of thin strut bio-resorbable-polymer drug-eluting stents, intravascular ultrasound (IVUS) guided stent implantation, contemporary chronic total occlusion revascularisation techniques and guideline-directed medical therapy. The rate of major adverse cardiac and cerebrovascular events (MACCE [composite of all-cause death, cerebrovascular event, any myocardial infarction and any revascularisation]) at one year was compared to a predefined PCI cohort from the original SYNTAX-I trial selected on the basis of equipoise 4-year mortality between CABG and PCI. As an exploratory endpoint, comparisons were made with the historical CABG cohort of the original SYNTAX-I trial. Overall 708 patients were screened and discussed within the heart team; 454 patients were deemed appropriate to undergo PCI. At one year, the SYNTAX-II strategy was superior to the equipoise-derived SYNTAX-I PCI cohort (MACCE SYNTAX-II 10.6% vs. SYNTAX-I 17.4%; HR 0.58, 95% CI 0.39-0.85, P= 0.006). This difference was driven by a significant reduction in the incidence of MI (HR 0.27, 95% CI 0.11-0.70, P= 0.007) and revascularisation (HR 0.57, 95% CI 0.37-0.9, P = 0.015). Rates of all-cause death (HR 0.69, 95% CI 0.27-1.73, P = 0.43) and stroke (HR 0.69, 95% CI 0.10-4.89, P = 0.71) were similar. The rate of definite stent thrombosis was significantly lower in SYNTAX-II (HR 0.26, 95% CI 0.07-0.97, P = 0.045). 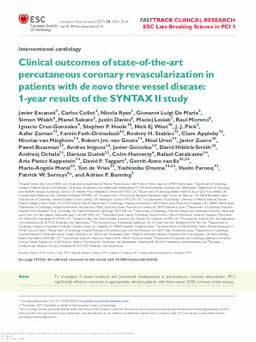 Conclusion: At one year, clinical outcomes with the SYNTAX-II strategy were associated with improved clinical results compared to the PCI performed in comparable patients from the original SYNTAX-I trial. Longer term follow-up is awaited and a randomized clinical trial with contemporary CABG is warranted.